So last time I said the feature creep was all under control… Yeah, I might’ve been stretching my words a little. But for how it turned out, I don’t regret this little detour at all. 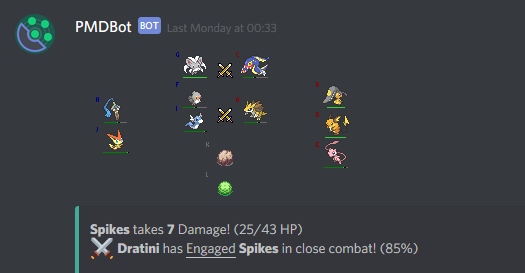 As of this week, PMDiscord now has procedurally-generated images during battles. The original plan was to keep everything in PMDiscord in plain text, but as the game grew in features, it really limited how much information could be shown at once – at least not without drowning the players with walls of paragraphs and numbers. A better fix for this was needed, and this was the result. The new interface conveniently shows team sides, health bars, map objects and monster positions, in a way that is much easier than calling two or three different text commands. I also think it looks pretty neat, so there’s that. The balancing mentioned in the last Progress Log has turned out well. 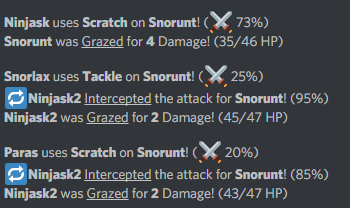 A slight update to the Speed stat means faster monsters will take less damage from ‘Grazed’ attacks, while slower monsters take almost as much damage as a direct hit. Fast PKMN are now much better all-round attackers, and can also use their speed to tank hits if they play their positioning right. The fastest ‘mon in the game shows off how it’s done. After some more playtesting, the game has also been fine-tuned in a couple other areas that needed it. Monsters now heal passively for every turn they aren’t attacked, and they heal twice as fast while hiding behind another object or monster. This was added to encourage the game’s Hiding mechanic, and to make it lot more desirable to Retreat when a monster’s in a bad position. The AI has also been taught to make use of this, to help make them that much more of a threat. Speaking of, adding more challenge to the game is still on the agenda, but there’s an ever-growing list of issues to fix first. The main priority this week is to get the database shifted over to use SQLite, which should help a lot with the server’s loading speeds and memory use. There are also some mystery issues that cause large-scale battles to crash, which I haven’t found the source of just yet, but should hopefully be resolved this coming week. Stay tuned for the next.